Lapped by the Indian Ocean, Sri Lanka is known for its enchanting ancient ruins, endless soft-sand beaches, imposing mountains, colourful festivals and dense wild-life. Besides, this island country has a great history and treasured heritage as this is related to one of the most important scriptures of Hindu mythology, the great epic Ramayana. Right from the site of Seetha’s abduction to the killing place of Ravana, there are so many mythological and historical places in Sri Lanka that can be visited as part of Sri Lanka Tour Packages. Highly popular among the locals as well as the tourists, Ramayana Tour in Sri Lanka will give you a spiritual travel experience and also an immense knowledge about the rich Sri Lankan heritage. Here is the list of 10 must visit Ramayana related sites in Sri Lanka. Chilaw is one of the popular and important Ramayana related places in Sri Lanka as it is home to popular Munneswara Temple and Manavari Temple. These two temples are the main Ramayana related places which can be visited as part of Sri Lanka Ramayana Tour. Munneswara Temple is dedicated to Lord Shiva and is considered as the oldest Hindu temple in Sri Lanka. It is believed that this temple was the place where King Rama prayed to Lord Shiva in order to get rid of Brahmahatya Dosha as he had killed king Ravana who was a Brahmin. As advised by Lord Shiva, Lord Rama installed four Shivalingas at four different places namely Manavari, Thiru Koneshwaram, Thiru Ketheshwaram and Rameswaram in India to get rid of Brahmahatya Dosha. 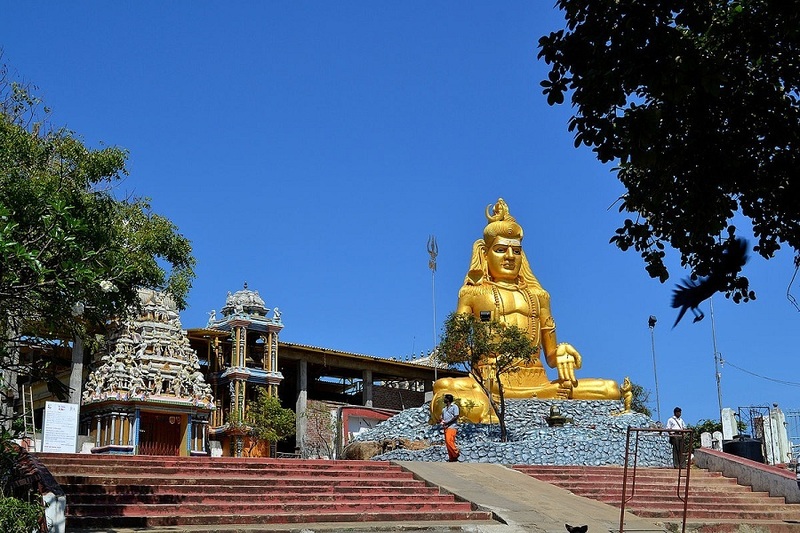 About 6 km from Chilaw, Manavari Temple is the first place where Lord Rama installed and prayed the Shivalinga. It is called as Ramalingam as it was erected by Lord Rama. Rameswaram in India is the only other lingam in the world named after Lord Rama. 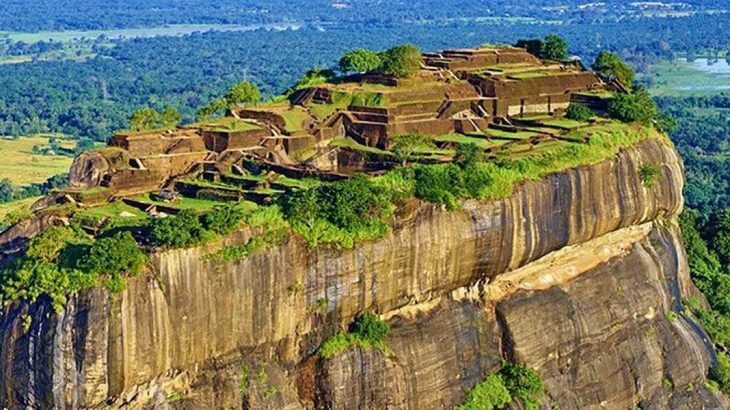 Sigiriya, also known as Lion Rock, is an ancient capital of Sri Lanka and arguably one of the most important UNESCO World Heritage Sites that one should not miss during your Sri Lanka Tour. Often considered as the Eighth Wonder of the World by locals, this ancient fortress has significant archaeological importance and attracts thousands of tourists every year. 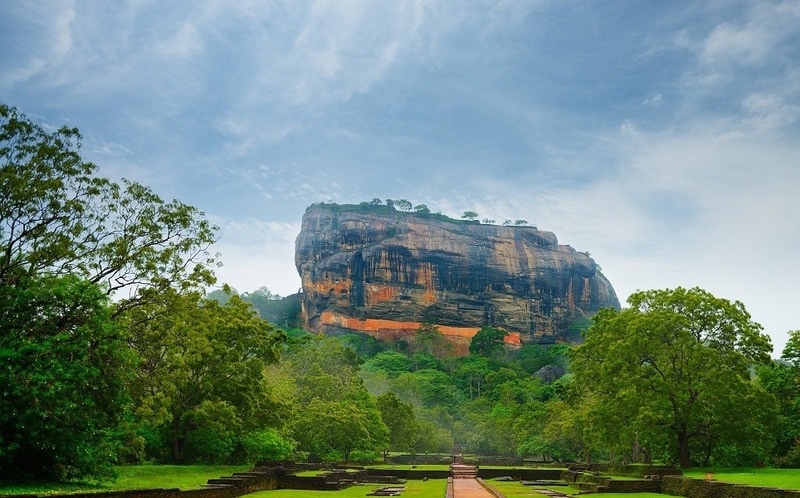 Besides its world famous rock fortress, Sigiriya is also the place that is related to Ramayana tales. According to the legend, Naguliya Cave in Sigiriya is believed to be one of the places where Ravana kept Seetha Devi captive in Sri Lanka. Besides its golden sandy beaches, Trincomalee holds a significant role in the religious and cultural history of Sri Lanka as it is home to historical Thirukoneswaram Temple. Often regarded as Dakshina Kailasam, Koneswaram The temple is said to have been built by Agastya Rishi on the instructions of Lord Shiva who was impressed by King Ravana’s devotion. It is also believed that this was the place where Lord Rama installed the second lingam after Manavari Temple in order to get rid of the Brahmahathya Dosham. 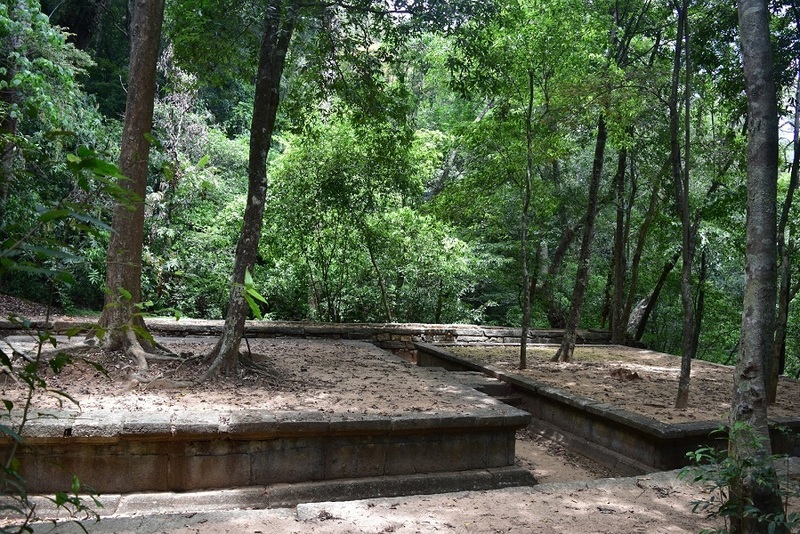 This temple is revered as one among the Pancha Iswarams in Sri Lanka. Sits idyllically at the edge of a cliff, it offers some brilliant views of nearby plains and the Indian Ocean. Nuwara Eliya, the popular hill station of Sri Lanka, is also a great destination for spiritual travelers as it is home to Divurumpola, Gayathri Peetham, and Seetha Amman Temple, among the popular places related to Ramayana tale in Sri Lanka. 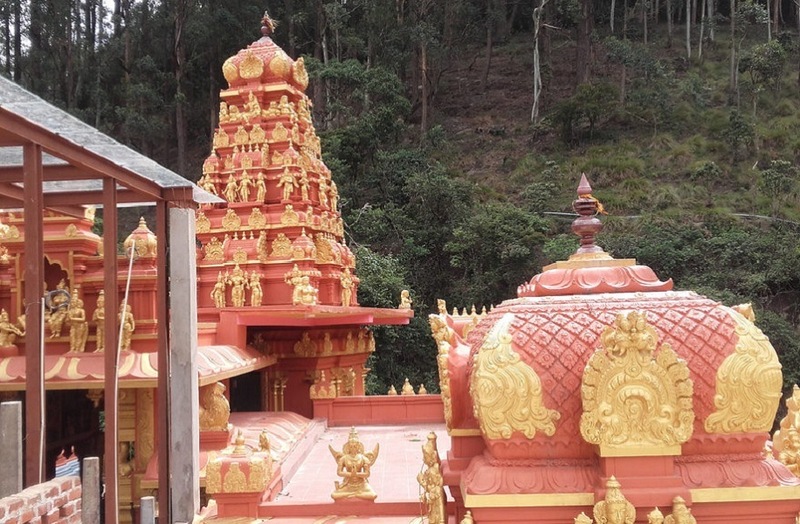 Situated inside Nuwara Eliya town, Gayathri Peetham is said to be the place where Ravana’s son Meghanath propitiated Lord Shiva with penance and in turn was granted super natural powers by the mighty god prior to the battle. 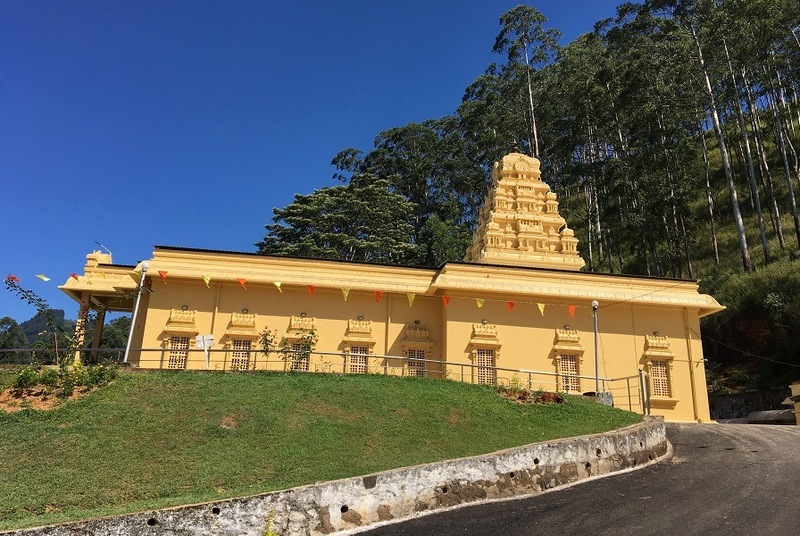 About 5 km from Nuwara Eliya, Seetha Amman Temple in Seetha Eliya is a unique temple dedicated to Seetha Devi, Lord Rama, Lakshmana and Hanuman. According to the legend, this temple is said to be the site of Ashok Vatika where Goddess Sita was held captive by Asura King Ravana and also believed that the river next to the temple is where Seetha bathed. One can also visit Hakgala Gardens at Nuwara Eliya which is believed to be Ashok Vatika where Ravana kept Sita captive. 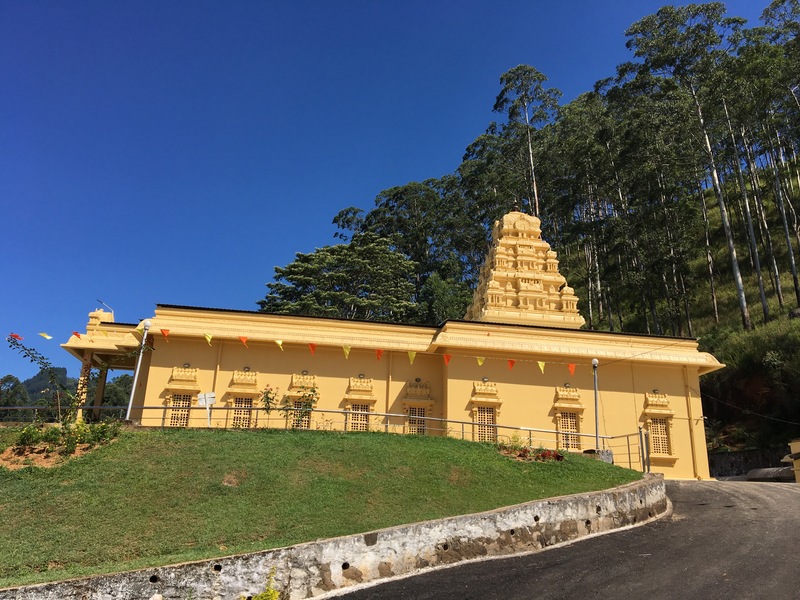 At a distance of 20 km from Nuwara Eliya, Divurumpola is believed to be the place where Seetha Devi underwent the “Agni” test of fire where she proved her innocence and purity to Rama. In local Sinhala language Divurumpola means the ‘place of oath’. Ella is another significant place to be visited as part of Sri Lanka Packages as it boasts two locations linked to the great epic Ramayana. This small picturesque mountain village is known for Ravana Ella Falls & Ravana Caves. Falling from a height of about 25 m, Ravana Ella Falls is named after King Ravana and is believed that Seetha bathed in a pool that accumulated the water falling from this waterfall. Situated at a height of about 1370 m, there is also a small Ravana Ella Cave near the falls and is believed that this cave was used by King Ravana to hide princess Seetha. Because of its natural beauty and gushing waterfalls, this is one of the best places to visit in Sri Lanka. Colombo, the commercial capital and largest city of Sri Lanka, is also home to two famous temples that are related to Indian epic Ramayana. They are Anjaneyar Temple and Kelaniya Temple. 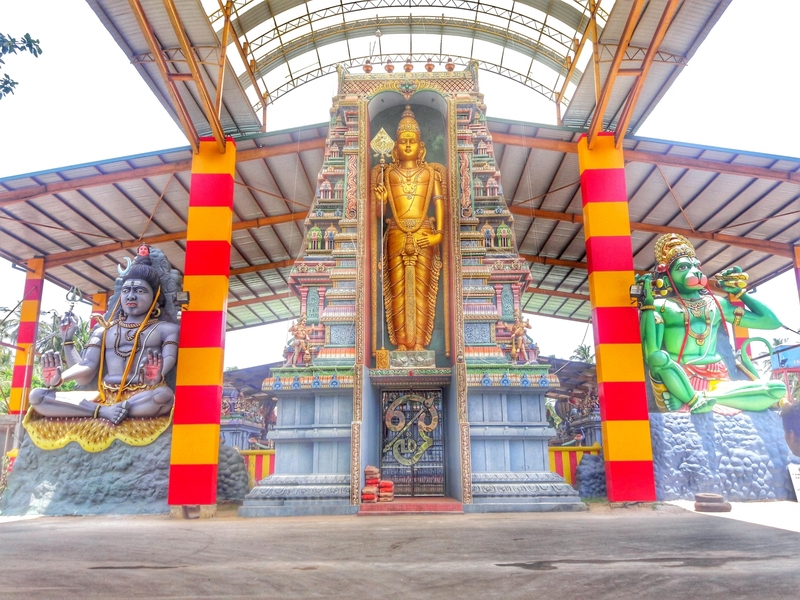 Dedicated to Lord Hanuman, the Anjaneyar Temple is the first temple in Sri Lanka in his Panchamuga form and it is said to be the only temple in the world to have a chariot for Anjaneyar. The chariot festival of this temple is held annually in December or January and is a popular temple festival in Colombo. 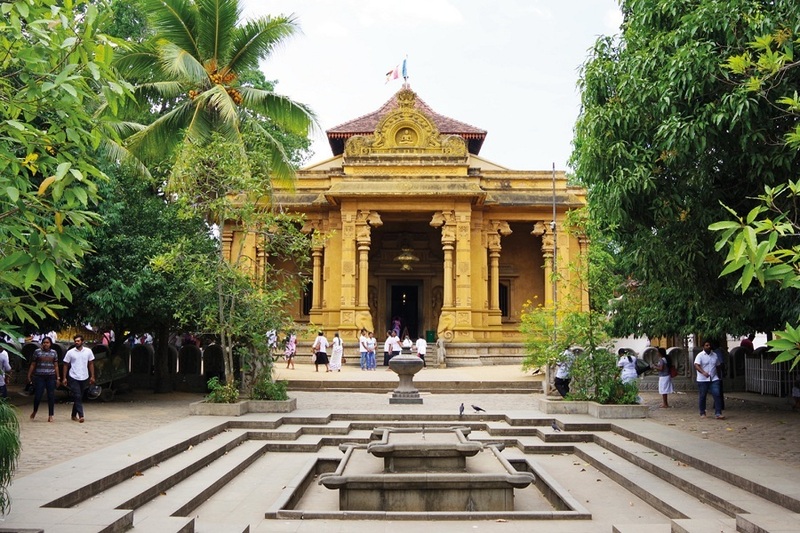 Among the most important and closest sites to Colombo connected to Ramayana is the Kelani Raja Maha Viharaya or the Kelaniya Temple. Kelaniya is believed to be the place where Vibhishana was coronated as the king of Lanka by Lakshmana after the death of King Ravana. There are also some beautiful murals depicting the crowning of Vibhishana outside the Buddhist temple. Vibhishana is venerated by Sinhalese Buddhists as a god as they believe him to be one of the main protectors of the island. 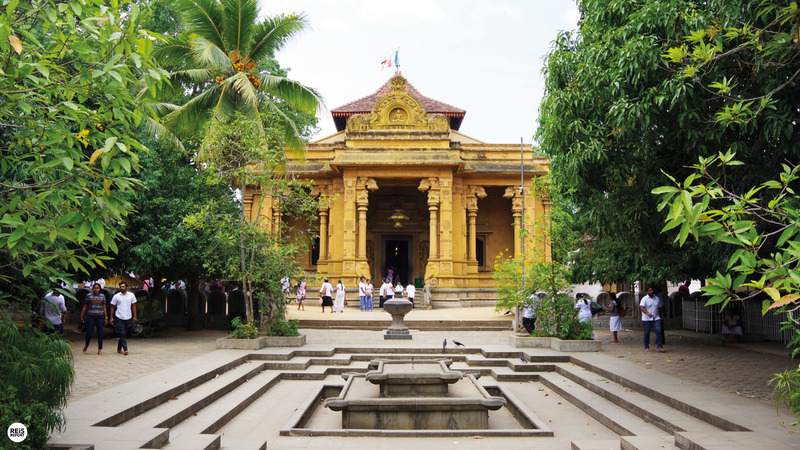 The Kelaniya Raja Maha Viharaya is a sacred place of worship for Buddhists in Sri Lanka and it is one of the three places in the country where Lord Buddha is supposed to have visited. At a distance of 50 km from Kandy, Ramboda is a scenic village located in the Central Province of Sri Lanka. It is well-known for its stunning Ramboda Falls and historical Sri Bhakta Hanuman Temple. 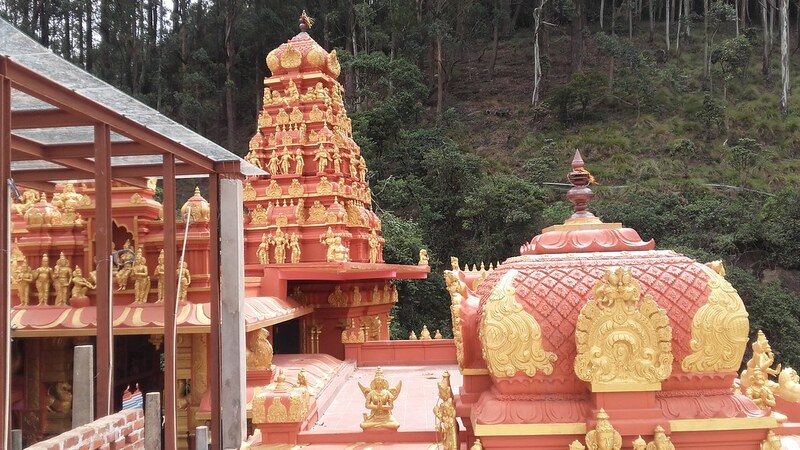 The temple of Bhakta Hanuman was built by Chinmaya Mission on the hills of Ramboda where Lord Hanuman is believed to have searched for Seetha. The temple has a 16 feet idol of Lord Hanuman along with Vinayakar, Rama, Seetha and Lakshmana. It is one among the must visit places that are related to Ramayana during your Sri Lanka Trip. The name Ramboda is also associated with Rama’s army as this was also the place where the two armies faced each other for the first time, Lord Rama’s army on the Ramboda hillside and Ravana’s on the other side, separated by the Ramboda Lake. There is a pond called ‘Sita Tear Pond’ nearby, which is said to be formed from Seetha Devi’s tears. 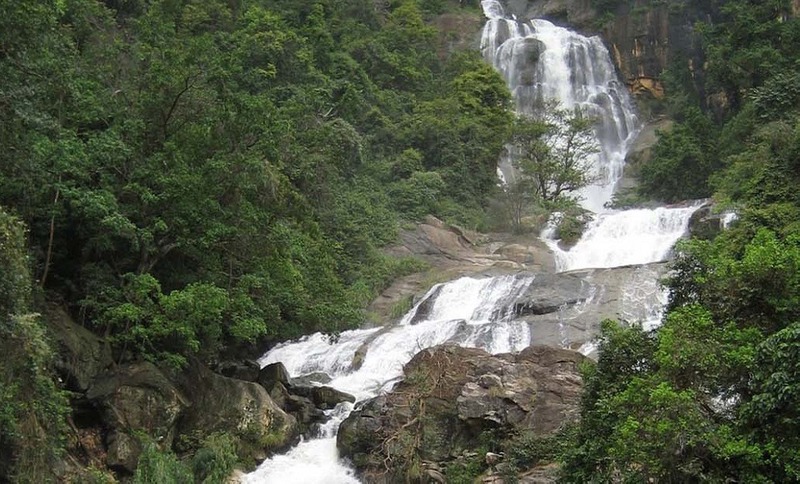 Situated at Ramboda Pass, Ramboda Falls is a mesmerizing waterfall which cascades down from a height of about 109 m. It is one of the highest waterfalls in Sri Lanka and among the best places to visit in Sri Lanka. Close to the Ramboda Falls, there is a Ramboda Tunnel which is currently the longest road tunnel in Sri Lanka with 225 m long. 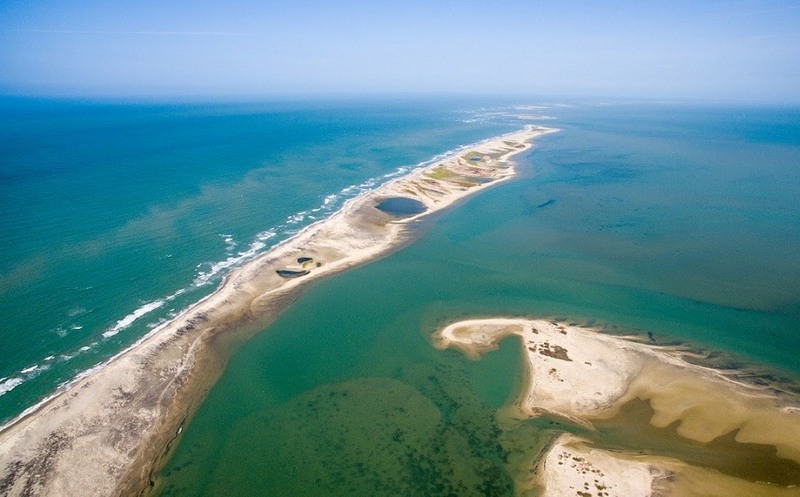 Overlooking the Gulf of Mannar, Mannar is an island in the north western part of Sri Lanka and is home to the historic Ketheeswaram Temple, one of the five Sivan temples in Sri Lanka. 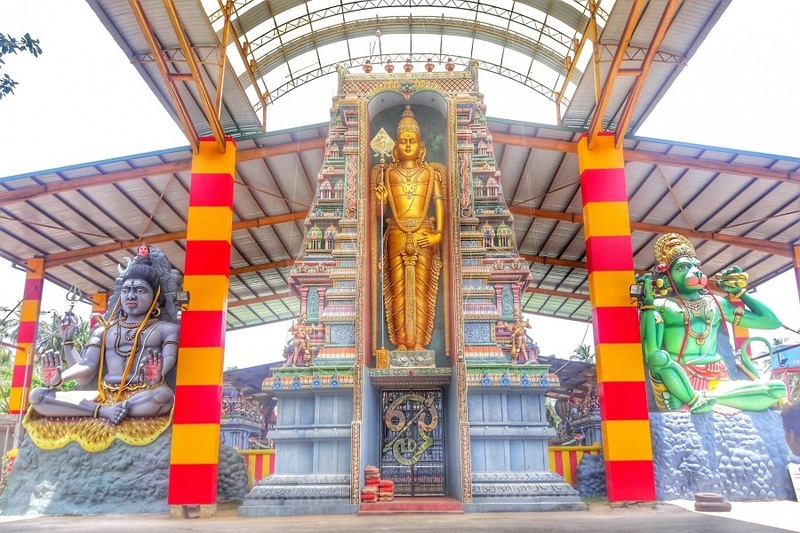 Built by Mayan, father-in-law of Ravana, Thiru Ketheeswaram is also closely associated with Ramayana as it is one of the three Shivalingas installed by Lord Rama in Sri Lanka. Thiruketheeswaram is also believed to be the birth place of Ravana’s queen Mandodhari. One can also visit Adam’s Bridge or Rama Sethu in Talaimannar which is considered as an essential part of the Ramayana. According to legend, Rama Sethu is a legendary bridge supposed to be built by Rama with the help of Hanuman and his army in order to reach Lanka. 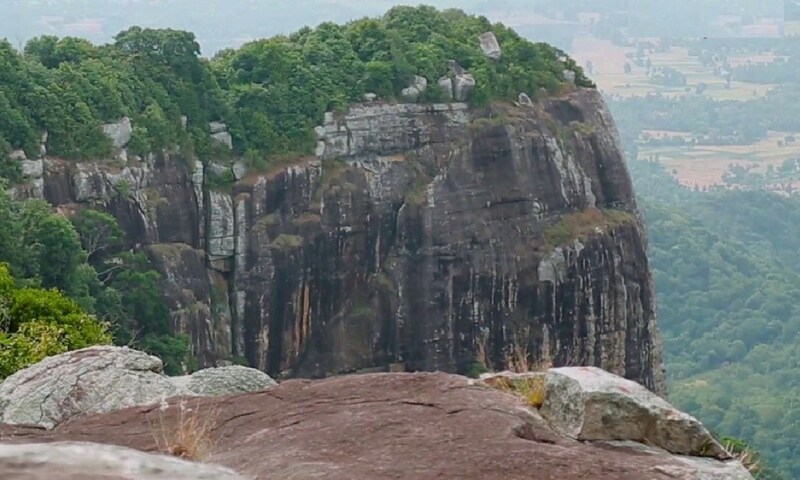 Located near Hiripitiya, Dolukanda is another famous place in Sri Lanka with strong links to the Indian epic Ramayana as it is one among the five places where Lord Hanuman accidentally dropped a piece of Sanjeevani Mountain. According to the legend, Lord Hanuman was asked by Rama to fetch herbs to save Lakshmana who were seriously wounded during the war with King Ravana. Hanuman had brought the whole Sanjeevani Mountain as he was unable to identify the herb. While flying, some parts of the mountain fell on five places in Lanka namely Dolukanda, Rumassala, Ritigala, Thalladi and Kachchativu. Now, there is a grand yet dilapidated monastery at the foothills of Dolukanda which was also served as a healing center during the Anuradhapura period. Situated close to Gurulupotha, Sita Kotuwa is one of the important places to visit in Sri Lanka as part of Ramayana Tour Packages. This is the first place where Sita was held captive by King Ravana after kidnapping her. Surrounded by waterfalls and streams, this was the place once the city of Lanakapura stood and Seetha Devi was kept at queen Mandodhari’s palace at Lankapura until she was moved to Ashoka Vatika. Seetha Kotuwa means Seetha’s Fort and got its name because of Seetha Devi was stayed here. From endless soft-sand beaches to enchanting UNESCO World Heritage Sites, imposing mountains to dense wildlife, and from popular Buddhist worship places to renowned Hindu temples , there are so many tourist places in Sri Lanka. Besides, this island country is also home to some ancient spiritual places that are related to the great Hindu epic Ramayana. If you are fond of history and mythology, then Sri Lanka is the best place to experience some importent places associated with Ramayana as part of Sri Lanka Tour Packages offered by Trawell.in. All, Destinations Pilgrimage in Sri Lanka, Ramayana Related Places in Sri anka, Ramayana Tour in Sri Lanka, Sri Lanka Packages, Sri Lanka Ramayana Tour, Sri Lanka Tour, Sri Lanka Tour Packages, Sri Lanka Trip. permalink.